Palliative care is a multidisciplinary team approach designed to ease suffering and improve quality of life for patients with serious illness. This transformative type of care is most effective when each member of the team is grounded in the principles and skills that are the backbone of whole-person, patient-centered care for patients and families experiencing life-limiting disease. 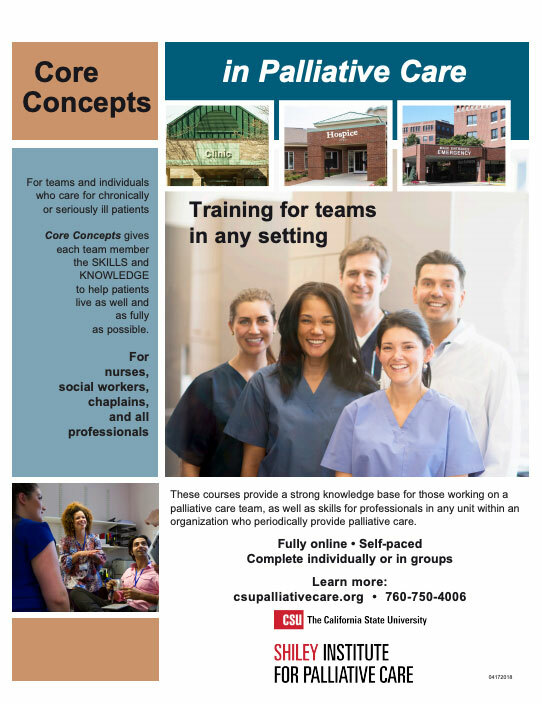 Originally created in partnership with one of the largest healthcare organizations in the United States, Core Concepts in Palliative Care—All Health Professionals provides healthcare professionals across a variety of disciplines with a comprehensive framework for understanding palliative care, and the strategies it utilizes to reduce suffering, manage symptoms and improve quality of life for patients and families with serious illness. This course is appropriate for all disciplines and is included in other Core Concepts courses focused on chaplains, social workers, and nurses. The curriculum is self-paced and can be completed on your own schedule, whenever is most convenient. This course gave me a foundation of education and tools needed to assist patients with chronic serious illness. This course gave me resources to continue to build knowledge in palliative care. Great overview that was comprehensive and thorough.